This post will be a quick one. A friend recently told me about a salad dressing that she came across that was “so good you could eat it by the spoonful”. In fact, she had made it so often since she got the recipe, that she had it committed to memory. Thus the recipe was given to me on a purple Post-It Note that has become a permanent decoration in my kitchen. Alex and I have become addicted to this dressing, and have had more salads that we normally would. The best part about the recipe? Everything is proportional, so you only need one measuring spoon. In my example below, I’ve used a tablespoon. 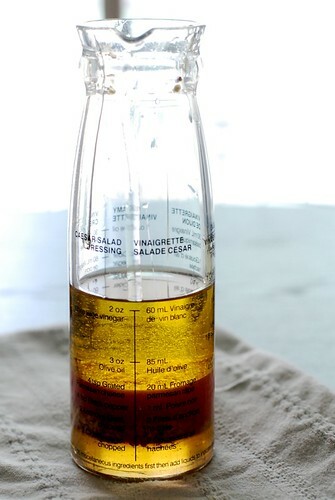 Measure out the olive oil first into a bowl or a salad dressing jar. This way, your spoon has a light layer of oil to help get the honey out later. Add in the honey, dijon mustard, and red wine vinegar. Make sure you don’t skimp on the honey – a little more sweetness makes all the difference! Finely chop up the toasted almonds. You could just put in ground toasted almonds if you have that on hand. However, I like toasting mine and then chopping – a little bit of grittiness in the dressing isn’t bad at all! Add salt and pepper to taste – I find I usually need about 1/4 tsp. salt and some freshly ground pepper would do. Let it sit for about an hour before serving, so you get more almond flavour coming through the dressing. The small batch above can last us a couple of days, and the dressing is equally as delicious, if not more, on the second and third days. We usually just toss it together with romaine lettuce, tomatoes, red onions, and cucumbers – simple and delightful!